The flags of Tunisia, Libya, and (in the background, right) Egypt fly at a crowded demonstration in Tahrir Square,Cairo, February 25, 2011. Anyone looking at North Africa and the Middle East today would be forgiven for thinking that the Arab Spring has rapidly turned into a bitter winter. The revolutionary road embarked upon by a number of countries looks ever more precarious. Syria is still being torn apart by civil war, in Libya the government is struggling to impose its authority, and Egypt appears to be experiencing a reversal of the democratic gains it had made as the “deep state” consolidates its position. Yet, within this overwhelmingly gloomy picture, recent developments in Tunisia are cause for optimism. Tunisia provided the spark for the Arab uprisings three years ago with the self-immolation of Mohamad Bouazizi in Tunisia’s neglected interior. As the transition got underway, hopes were high for this small North African country. 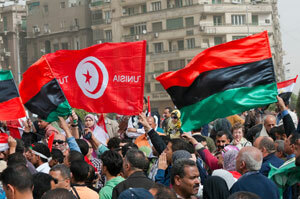 Tunisia’s domestic situation seemed to augur well for the transition process. The country’s largely Arab and Muslim population was well-educated and traditionally orientated towards moderation. Indeed, promising first steps were made toward democratic transition, with free and fair elections, and the establishment of a transitional government tasked with drafting a new constitution. Economically, the country’s lack of natural resources seemed to be compensated by its vibrant tourist industry. However, initial optimism was dented as the country became mired in political crisis during 2013, following the assassination of opposition figures Chokri Belaid, secretary-general of the Unified Nationalist Democratic Party, and Mohammed Brahmi, general coordinator of the Popular Movement and a member of Parliament. In what became a highly polarized political environment, a series of mass strikes and violent protests against the government ensued, leading to the suspension of the drafting of the constitution in July and calls for a new head of government. Tunisia has, nevertheless, shown itself capable of stepping back from the brink. A spirit of compromise ultimately averted a descent into further violence and the potential derailment of the political transition process. Tunisia seems to have made the next step towards a more democratic political system with the ratification of a new constitution by the National Transitional Assembly on January 29, followed by the approval of a caretaker government comprised of technocrats charged with leading the country to the next legislative elections later this year. Despite the ups and downs over the last three years of drafting the constitution, political elites have shown themselves capable of compromise. Indeed, this, as well as the military’s role in Tunisia’s politics, stands in stark contrast with neighboring Egypt. Following the assassination of Brahmi and calls for a new head of government, former Prime Minister’s Ali Larayedh agreed to step down, paving the way for the establishment of a National Dialogue aimed at overcoming the political deadlock. In October 2013, Tunisia’s leading Islamist party, Ennahdha, and the main opposition parties entered into six months of National Dialogue mediated by the powerful General Union of Tunisian Workers (UGTT). The main goal of talks has been to resolve the political crisis by facilitating agreement on a new head of government, as well as to finalize a new electoral law and establish an electoral body to prepare for elections. In addition, the National Dialogue has had to resolve the deadlock in the National Constituent Assembly (NCA) in order to ensure the adoption of the draft constitution. Ennahdha required the support of the opposition parties to ensure the constitution’s adoption, making overcoming the gridlock critical. The road to agreement has been rocky, with political parties occasionally pulling out of National Dialogue talks. However, crucial compromises have been made on a number of thorny issues, such as the powers of the president and head of government, as well as on the judiciary and the constitutional bodies. On the question of the role of religion in the state, which has proved a highly divisive issue in the drafting process, Islamists have recognized full rights for men and women and secularists have accepted that Islam should be designated as the national religion. With the new head of government and a caretaker cabinet now agreed, the crisis that seemed to leave Tunisia teetering on the brink of chaos last year seems to have been overcome. However, the picture is not entirely rosy. While the National Dialogue appears to have saved the democratic transition for the time being, Tunisia’s political class remains highly polarized and future crises cannot be ruled out. While the new government is technocratic and comprised of independents, it has already come under criticism for containing two ministers that were in the previous Ennahdha-led government, most notably the Minister of the Interior Lofti Ben Jeddou. This reflects an ongoing mistrust of Ennahdha by secular political parties, which accuse it of doublespeak. The opposition also places the blame with Ennahdha for terrorist attacks and the rise of Salafists within the country, despite its efforts to distance itself from Salafi violence by designating the Ansar al-Sharia as a terrorist organization. Equally, Ennahdha’s leader Rachid Ghannouchi has implied that the security forces may have been behind recent violence in an attempt to weaken the former Islamist-led government. However, Ennahdha clearly wishes to avoid a similar fate to that of the Muslim Brotherhood in Egypt, which could ensure a continued willingness to set differences with secularists aside when it comes to the crunch. The social and economic challenges that also led to the revolution have not disappeared. Major tasks include easing the economic malaise and improving the socio-economic conditions of the population. Three years after the revolution, the economy in Tunisia remains depressed. While economic fortunes revived somewhat in 2012, last year witnessed a contraction. Badly affected by political uncertainty and increased violence in the country, the tourist industry and investor confidence have still not recovered. Moreover, the main challenges at the time of revolution–youth unemployment and regional inequalities–remain pressing issues. Yet debates on how to address the economic and social problems facing the country have been overshadowed by the political crisis. One can only hope that recent developments signal greater political stability ahead and the creation of the conditions under which the economic and social ills of the country can be better addressed. Tunisia’s political elite cannot afford to put these issues on the back burner much longer. Dr. Lisa Watanabe is a Senior Researcher in the Swiss and Euro-Atlantic Security Think Tank Team at the Center for Security Studies (CSS) at ETH Zurich. This article was first published by the International Relations and Security Network (ISN) in their blog. Louisa Lombard’s State of Rebellion explores the ambitious process of state-making amid the conflict in Central African Republic. Former Afghani Interior Minister Ali A, Jalali discusses the challenges of rebuilding institutions and state-society relations following periods of conflict and instability.